There are routine tasks connected with running a management system and its further development. Conducting internal audits or updating documentation needs resources as well as know-how. We help you meet these challenges by providing you with the proper services for the various responsibilities contained in a management system. That way, you can run your management system professionally and use your resources efficiently, and you can certainly develop them further. You can of course also combine components of our service package if you are operating an integrated management system, or if you want to add certain selected items to your existing management system. We support you in running your management system professionally. Take advantage of our experts’ know-how..
You can simply purchase from us a package of items. You can customize the items and use them for the services of your choice. The extent of our support is your call. You decide if we do merely preliminary work or take over the entire planning and functions of your management system. 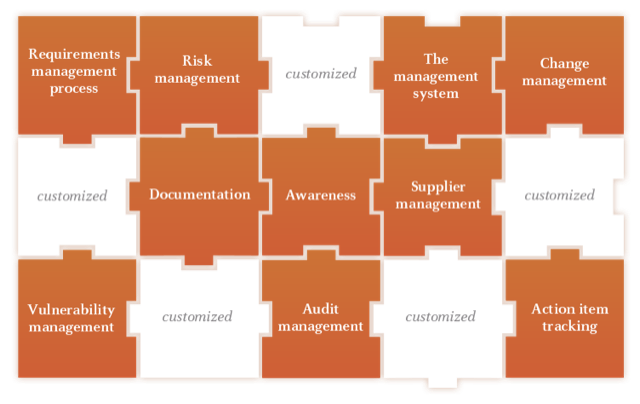 Our management system (as a) service consists of several packages that contain the available service components. Some of these packages contain services that never change, building the basic framework of our MS(aa)S. Certain packages are then added to this basic framework in line with items being offered, such as data protection. We support you in the analysis and assessment of the internal and external context of your organization. That includes adjusting your scope documentation as well as the maintenance of your management system’s statement-of-applicability. We support you in the entire risk management process, from the analysis of relevant information values to risk treatment. That includes, among other elements, information on possible threats as well as risk analysis. We support you in your efforts to steadily improve your management system. That includes your system’s efficiency assessment, preparing the management review and the presentation of its results to your top management. We support you in planning and conducting changes. That includes, among other items, the documentation of your change management processes as well as its continual improvement. We support you in controlling and updating the documents of your management system. That includes checking and updating your guidelines and process descriptions, among other topics. We support you in conducting training measures within the framework of your management system. That includes the preparation of training documents for various topics or planning awareness-raising campaigns. We support you in analyzing and monitoring your suppliers. That includes the rating of your suppliers in terms of their criticality for your business processes, and the monitoring of and compliance with agreements that have been made. We support you in the management of incidents and weak points. That includes the assessment of incidents based on type and severity, as well as the analysis of the incidents that have occurred including recommendations for actions needed to deal with those incidents. We support you in your internal audits. That includes, among other elements, drafting an audit program as well as planning, conducting and documenting the internal audit. We support you in managing and monitoring the measures you have taken. That includes monitoring deadlines, checking the implementation status or the efficiency assessment of the measures you have already conducted.